Today we’ll take a look inside the Linksys NSS4000. This is the entry-level unit in the Linksys One network storage family. You can read the official Linksys literature here, but technical info is rather lacking there (they don’t even say how much RAM is in the unit). The processor is a PMC-Sierra RM7035C, part of the MIPS family, running at 600MHz. 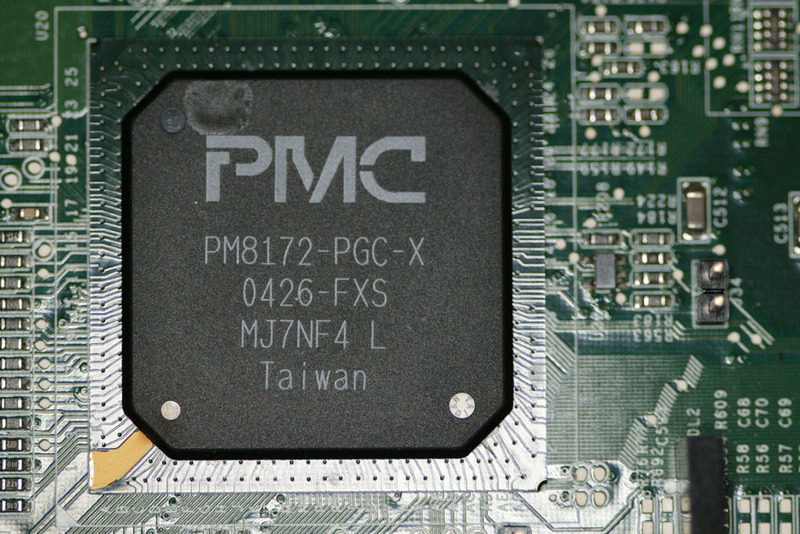 A PM8172 system controller provides the interface for most other peripheral controllers on the board, as well as being the attachment point for the system’s 128KB of Hynix SDRAM. Other notable components are an ITE IT8712 Super I/O controller and IT8907E USB flash controller, connected to a 512MB Samsung flash chip; Promise PDC40518 SATA controller; NEC UPD720101 USB 2.0 controller; SafeXcel 1741 security co-processor; two Marvell Yukon Lite 10/100/1000 Ethernet controllers (under heat sinks), and a MX 29LV800CBTC 1MB boot flash. Version: PMON2000 3.1.17-B019 (PM74101) #0: Mon Jan  8 12:24:25 PST 2007. Hit any key to return to PMON prompt or power down. Autoboot command: "boot /dev/sd0@0x100 root=/dev/scsibd2 hwrev=3"
Press  to execute now or any other key to abort. Secondary cache size 256K, linesize 32 bytes. Synthesized TLB refill handler (23 instructions). Synthesized TLB load handler fastpath (35 instructions). Synthesized TLB store handler fastpath (35 instructions). Synthesized TLB modify handler fastpath (34 instructions). Using 300.640 MHz high precision timer. ohci_hcd 0000:00:01.3: Itentionally disabling ITE USB controller. Hooray! Discovered SCSI boot device! found device at 0x14014030 irq 0. Root device ("/dev/scsibd2") is now online. 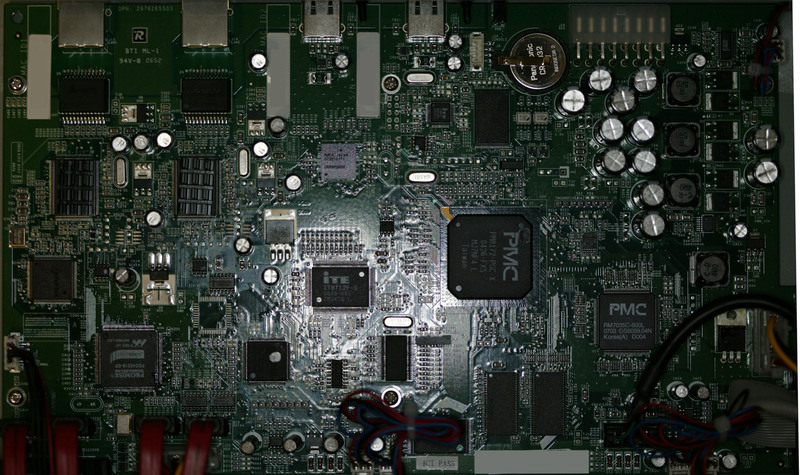 Board hardware revision is . Default RAID metadata version is 1.2 .
md: using maximum available idle IO bandwidth (but not more than 7000 KB/sec) for reconstruction. md: using 128k window, over a total of 390711232 blocks. md: resuming recovery of md0 from checkpoint. Updating ARP cache of other devices on this subnet. Please wait 2 sec. Starting Network Interface Plugging Daemon:No bonding device present. This is a master device. Bringing link down and then up. Bringing up master link for bond. bonding: bond0: link status up for interface eth0, enabling it in 200 ms.
NET OK: All active interfaces are online. watchdog not started (userland have to keep it that way). At that point, I did a ^D to continue with the startup process (necessary to mount the filesystems on from the USB flash drive) and then did a “passwd root” to change the root password. And I had my SSH console working. That’s it for now – in a subsequent article I will discuss building the NSS4000 software from the Linksys GPL distribution, as well as adding additional utilities. UPDATE: The diag jumper also causes additional testing while in the PMON2000 monitor, as well as preventing unattended booting (since one of the PMON diagnostics fails, autoboot is disabled). A better way to enable the dropbear SSH server is to leave the diag jumper off and to edit line 26 of the file /linuxrwfs/etc/init.d/S02hwdep to read /usr/sbin/dropbear_start.sh instead of /usr/sbin/dropbear_stop.sh. This entry was posted on Sunday, April 15th, 2007 at 9:56 pm	and is filed under Computers. You can follow any responses to this entry through the RSS 2.0 feed. You can skip to the end and leave a response. Pinging is currently not allowed. 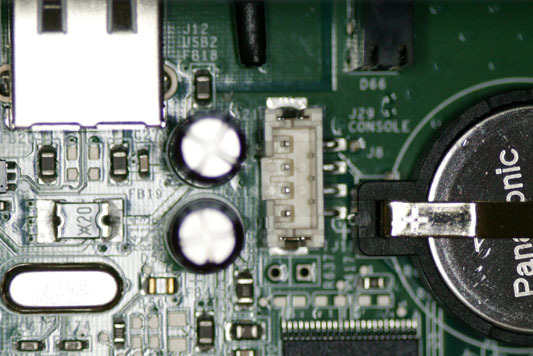 Do you know what pin 1 is for the console connector ? From your research with the NSS4000 were you able to determine what software is used for encrypting the volumes? Meaning, what would be the command line utilities / options to mount an encrypted volume by hand for this device given a know plaintext password? I haven’t really looked into the encryption setup. However, there’s an industry-standard encryption accelerator in the NSS, either as a separate chip (NSS4000) or as part of the CPU chip (NSS6000). If you get to the console on the NSS, you should be able to look at the various startup scripts to see how the NSS does the mounting of encrypted volumes. This was useful information. Based on it I found another way to change the root password and start sshd. It involves using the feature on the web interface that stores and retrieves the configuration information. One of the things that gets stored is a the crontab for root. So from there you can run /usr/sbin/chpasswd and run /usr/sbin/dropbear_start.sh as root. The benefit of this is that you do not need hardware and you do not need to open the case. keendog, please write more about your metod. keendog, Thanks! That was really helpful. Just a side note, the passwd & shadow files are also in the config. I was able to just copy and paste the encrypted password from my other user into root’s account in shadow, so no need for another cron job to change it. Now, anyone know of a way to get a compiler on this thing, or how to setup a cross complier for it? I’m able to view the console. And able to change the boot string. but after you wrote you start from a usb flash disk. What kind of image did you put on the flash disk? I’v got a nss6000. I’m now in the Read-Only console…. 1. 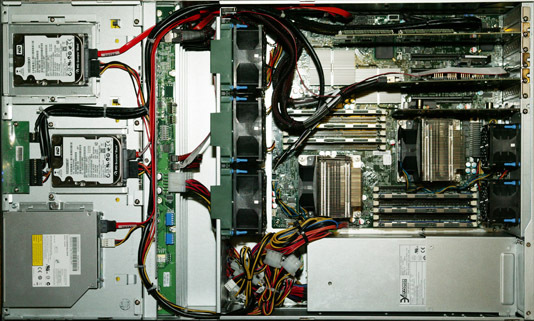 Start the nas in single mode. great solution Terry & keendog! i successfully startet the ssh dameon on the nss4000, but can’t change the rootpw? have tried it as described above copy & paste in the shadowfile, nothing. Can someone explain to me keendog’s method. I have a nss4000. I do not see where to run the commands to enable ssh so that I can fix these permissions issues. Thanks for any help. what is the correct settings for the terminal program to connect the NSS6000 (or NSS4000?) over the console port? Has someone information about the jumper (J28, J29, J31) on the NSS6000 Mainboard? Anyone know how to install a full blown distribution on the NSS6000? We are really unhappy with the restrictions/performace and general quality of the Linksys/Cisco version of the OS. They appear to be MIPS based and debian has builds for the MIPS architecture so it should be that hard….. It probably wouldn’t be that difficult. The PMON2000 bootstrap will load from USB storage devices (in fact, that’s how the “red light recovery fix” works, which might provide some hints). You might take a look at the way alternative distributions were loaded on the Linksys NSLU2 for more info. Could you help me with NSS6000 ? I’ve used my NSS6000 almost 2 years,and suddenly when I reboot device 2 days ago all my shares disappears. I see that array is not empty in webgui but I can’t see any of my data (60 GB). Linksys support can’t help me. All I need is connect to device with eg. Winscp to copy my data to safe location. I am not Linux spec so could you create ready to use firmware for NSS6000 with workin ssh server, plaease? I’m sorry, but the changes I made to the system were on a running NSS6000. I’ve never tried building a custom firmware update with the changes pre-applied and I don’t know if it is possible. Even if you enable SSH, you’ll want root access which you won’t get without either a serial console or by doing some tricks with backing up / restoring the config from a USB drive. I would *STRONGLY* advise you to not try changing any settings on the NSS until you have recovered your data. If you can’t get support from Linksys (I thought they offered premium pay-per-case support) I think your best bet would be to set up the serial console as described in my post. You don’t need to change any software settings to boot in single-user mode as root. You should then be able to mount the filesystem(s) with your data (if they are un-damaged) and (for example) FTP the data to another system. Thanks very much, your feedback is important to me. Unfortunatly Linksys not offers pay-per-case support in Poland, there is only call center. And nobody in Linksys don’t have any tools to connect to device in other way than by share. I don’t believe in this. You shuld teach this guys :). So I will try to restore to factory defaults my NSS6000 and see is this change something. I’ve sent you an email with some other ideas. As I said above and in that email, I’d recommend against making any config changes to the NSS until you are able to recover your data. It sounds as though this problem should be covered by Linksys support as it would seem to be caused by a bug in their software. Depending on whether you have your data backed up somewhere else, you could try updating the firmware (I’m not sure that does anything if you’re already at the latest version). Unfortunately, it doesn’t seem as though the NSS has a “reset to factory defaults” that will help you – the front-panel reset button only resets the networking configuration, and the web interface allows resetting everything else. But from what you say, the web interface probably isn’t running. There is a factorydefaults.tar.gz file in /factorydefaults on the NSS, which does contain a copy of the file you’re looking for. There are also various backup files (all ending in .nasbak) in /linusrwfs/etc, though I don’t think they’ll help in this case. I’m sending some additional information to you via email. I have experienced the same symptoms on my NSS 6000 as daniellysy – after reboot, all shares on one of 2 volumes did not appear again, even after a fresh reboot. A very simple action solved the problem for me: After creating a new, empty share on the same volume, all the other shared reappeared, were accessible from clients and contained all the data. Firmware is 1.16. I believe I have a way to gain root access without opening the case. Not sure home to start ssh yet, but should be doable once you can browse the filesystem. You need to do this with a “8 bit clean” editor (not notepad). I use vim under Windows. Then remake the config.NAS._blah_.tar.gz and restore. I haven’t tried this yet, but I can’t see why it wouldn’t work. If the above technique doesn’t make sense to you, I wouldn’t recommend trying it. There seems to be some checking going on — I was unable to export / via NFS. I wonder if this could be turned into an asterisk appliance box for a local storage system/low use PBX. I purchased and have been using a NSS6000 as my home storage for about a year now. Had to resign to the slow transfer rate, which for home its not much of a problem but certainly annoying waiting times. Has a tweak/fix been released by anyone to address the Transfer rate “lock-down”? @mem-nss – I don’t think it is a lockdown, more that the NSS4000/6000 boxes are just slow. Even when they were new, they didn’t benchmark as well as their competitors – for example, see this SmallNetBuilder review of the NSS4000 from 3.5 years ago. Frankly, if you don’t need the enterprise RAID / backup / etc. features, pretty much any current product (including a router with a portable HDD plugged in via USB) will probably out-perform it. If you look at the SmallNetBuilder review I linked above, there’s a link in there to their benchmark database. You can see how any new unit will perform, and at what price. I found a perfect way to overcome the poor performance, something similar to Terry. Fortunately (really!) the power supply of my NSS6000 started to send diagnostic messages just before the end of the warranty period, so I gave back the unit and got back the money. I bought immediately a HP DL180G6 with a hardware RAID controller card, put the 4 x 2 TB HDD-s into it, installed openSUSE and now I can get some 100 MB/s throughput from it. There are several drawbacks of this solution: the DL180 is MUCH more noisy so I had to put the whole thing to the loft. And it consumes remarkably more power so my electricity bill went higher. BTW, Terry, I am very much interested in about your new fileservers design! If you have a spare time for the article, please publish it! I know this thread is really old, but has anyone tried putting FreeNAS, Openfiler of just plain old command-line Linux on this? 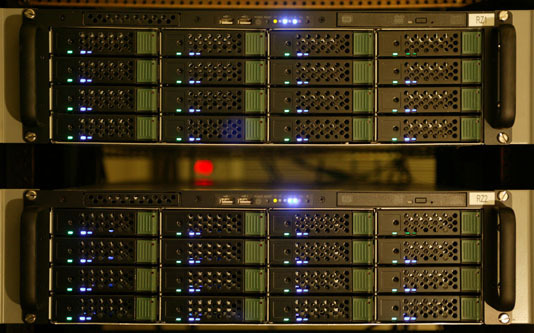 It’s starting to sound like the best way to overcome the (many) limitations, beyond hardware. @ldillon – Underneath the web interface is a stripped-down Linux. If you contact Cisco via these instructions (PDF), they will send you a URL to download the complete open source tarball for the NSS4000/6000 (they are built from a common source). I don’t know if that tarball includes the toolchain or not. 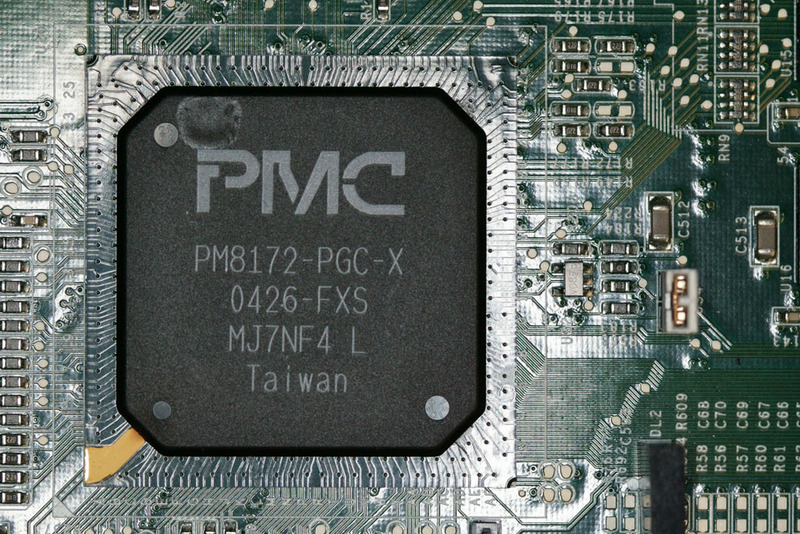 You’ll also need a Linux cross-development environment for the MIPS target – even if you could compile natively on the NSS, it would take approximately forever. The only “gotcha” is that you have the “recovery bootloader” between the normal bootstrap and whatever you’re trying to load. One of the early firmware updates trashed the flash-based bootloader, and the “quick fix” solution of the USB stick recovery bootloader was never improved on. That slows booting down by an unbelievable amount – if you connect a console cable, you’ll see the box flailing around for something like 5 minutes before it manages to load the actual OS. Re-create the tarball-ed configuration and restore it to the NSS6000 through the web interface. hey guys, found a way to gain root access on the NSS4000. Plug a usb stick in to the nas, backup the config and throw it in to your desktop. You need to add the line to start the SSH daemon. Create a sudoers file in /etc/sudoers giving your nas user sudoers access to all. SSH in, type sudo -s, enter password again and you have root access. Hope you are still reading here!? I have troubles with my nss6000 (shares and folders dissapear!!!). So i need access to this this device through ssh with root and hopefully i can fix it!!! @ksmedts – Yes, I’m still here. But I gave away my NSS’s quite a few years ago, so I don’t have any suggestions for you. You might try some of the techniques posted by others in the comments section. Terry you are such a nice hacker. Thanx for the article. For the information of all unlucky soles who own a NSS6000 . I was able to run debian mips on these box. I am able to see much better performance with a home grown RFS. I was able to get console with steps mentioned in the article and found it is running a MIPS RM9K based processor in BE mode ( opposed to NSS4000 which is having RM7K in LE) . Following debian mips how to (http://wiki.debian.org/EmDebian/DeBootstrap ) I have created simple rootfile system. For the time being I am using kernel flashed in onboard storage. I am working on creting custom kernel from GPL sources from cisco website. Here is the command I used to boot. If you want to boot from external USB connected. 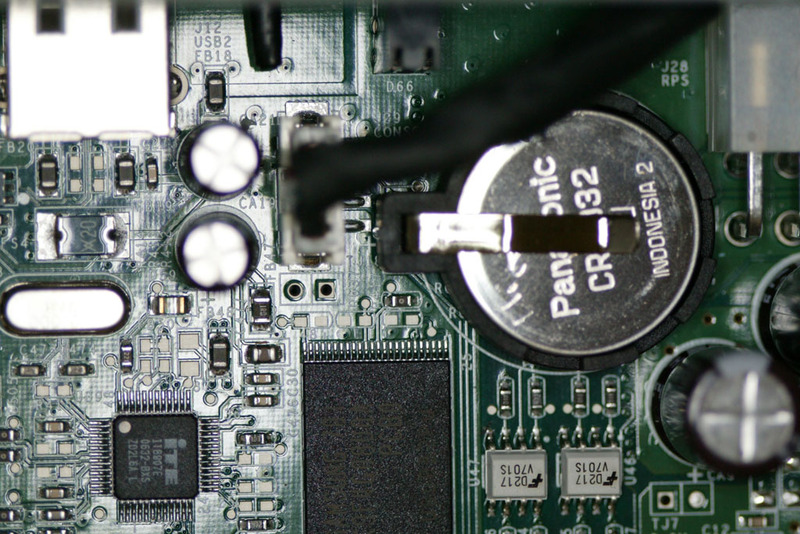 install MIPS RFS in USB stick. Plug-in to any of the usb slot. Press to execute now or any other key to abort. Version: PMON2000 3.1.22-B024 (PM74100) #1: Wed Sep 26 11:11:24 PDT 2007. BSP Copyright 2004, PMC-Sierra, Inc. Synthesized TLB refill handler (27 instructions). Synthesized TLB load handler fastpath (39 instructions). Synthesized TLB store handler fastpath (39 instructions). Synthesized TLB modify handler fastpath (38 instructions). Using 449.890 MHz high precision timer. You are using the Dallas DS1501 RTC. Checking for ‘wait’ instruction… available. Blinking the green power LED (32). scsiglue: Got USB boot device match! Device manufacturer: ITE TEC. INC.
sd: Hooray! Discovered SCSI boot device! md: Skipping autodetection of RAID arrays. Assembling MD arrays…done (disabled in /etc/default/mdadm). Exporting directories for NFS kernel daemon…exportfs: Warning: /mnt/mips does not support NFS export. Starting MD monitoring service: mdadm –monitor. I need access to shell, to run file permission repairs, as some shares have become “crazy”. Hi, an4linu, could you please update your progress on nss4000/nss6000 firmware creation?